This year we’ve grown a lot of kolaska peppers (the red ones in this photo) because we enjoyed their sweet, spicy flavour so much last year. At the end of last season we were left with green ones that weren’t going to have time to ripen so I pickled them. Yesterday I tried pickling some red ones to make it easier for my daughter and her partner to take some back to Wales with them. 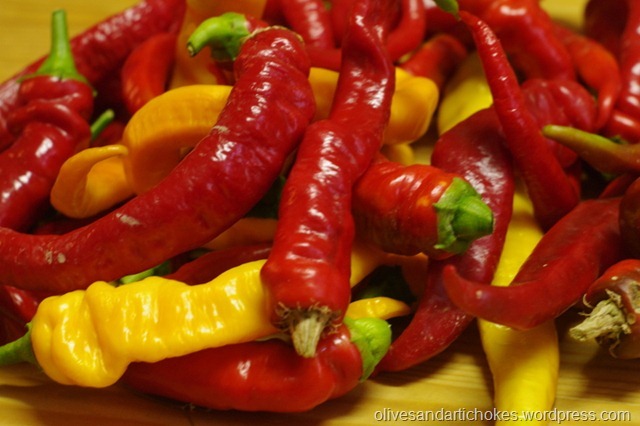 The yellow ones seem to be an unintended (but welcome and tasty) cross between the kolaskas and chorizo peppers. I brought to the boil a mixture of half vinegar (cider vinegar because I’d run out of wine vinegar) and water and added some sugar, some sprigs of rosemary and a few bay leaves. 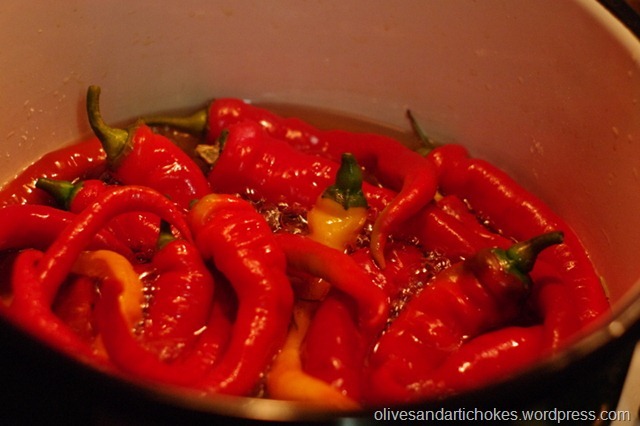 I used 250 ml vinegar, 250 ml water and 100 grams of sugar – you need enough to cover the peppers but not too much. I simmered them for about 10 minutes until the peppers were cooked but not too soft, packed the peppers into jars and covered with the vinegar mix. They make a good tapas dish and should keep for months, but my daughter says they’ll be eaten quite quickly. This entry was posted in peppers, pickles by chaiselongue1. Bookmark the permalink. When I look at wonderful preserves and I ask myself why am I not doing this – it could be that I’m just too lazy. I love these peppers as tapas. I’m lazy too, but these are so easy to make! I am so excited that you´ve posted this as our peppers are now starting to “kick in”…Big Man kept saying “don´t dry or freeze them all this year, let´s pickle some”. Now I know how!! You’ll enjoy them and it’s a great way to preserve a summer glut. Oh! Peppers!! Your post is an ode to peppers!! I have never tried pickled peppers! This sounds great! 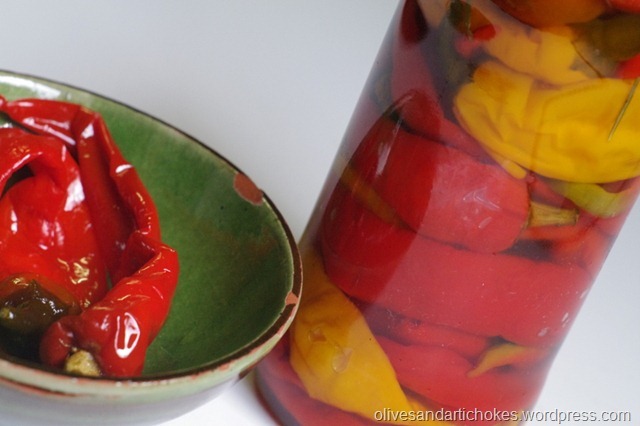 Beautiful pickled peppers, a great way to enjoy your summer harvest all year. I just recently posted about pickling my sport peppers which are the traditional hot dog toppers in Chicago. Good luck with the rest of your harvest!